A great way to enjoy popcorn and add flavor is by making cheese popcorn recipes. 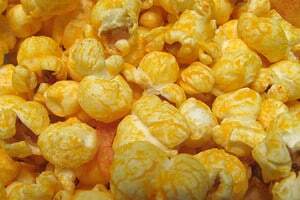 Cheese popcorn is a tasty treat and it ranges from the fluorescent orange kind in the tubs to gourmet cheese popcorn with freshly shaved Parmesan cheese. We will try to provide many cheese popcorn recipes that you can follow. When you make cheese popcorn at home you can tweak the recipes to your liking and add or remove herbs and spices that you enjoy. We've scoured the Internet and popcorn books and relied on our own experience to gather the best cheese popcorn recipes we've found. We hope you enjoy them! A great way to make popcorn more gourmet is by adding cheese to it. With this rosemary and Parmesan cheese popcorn recipe we go for the simple method of adding a tasty herb and some great cheese to traditional buttered popcorn.